From February 2017 Arrow Leadership Australia, together with the Arrow Community globally, will support a newly created Arrow organisation focussed on researching and trialling pathways for establishing Arrow in developing countries. This reflects the outcome of a recent gathering in Belfast, Northern Ireland, where representatives of the Arrow Alliance (Australia, Canada, Denmark, Ireland, New Zealand, Norway, Philippines, Poland*, United Kingdom and United States of America) determined to do more to serve leaders in the Majority World. Liam Glover, Executive Director of Arrow Leadership in Australia, said that Julian Dunham, currently serving as the Emerging Leaders Program Director in Australia, will take a lead role in this new organisation. “Julian’s experience in scaffolding the establishment of Arrow Leadership in New Zealand and the Philippines over the last five years, makes him the ideal candidate to serve in this new role,” Liam said. 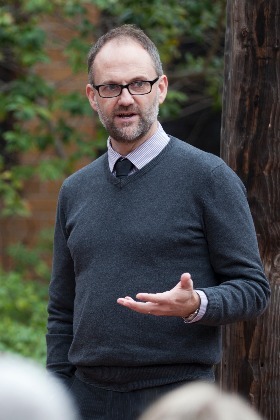 Julian Dunham has served as Program Director of the Emerging Leaders Program in Australia since 2008. During this time, he has enhanced the methodology and experiential dimensions of the program. Julian has worked to enrich the Arrow Leadership experience through expanding the role of State Coordinators, developing intentional connections between participants and mentors/coaches, and engaging high-calibre speakers and volunteers in the program. Under Julian's leadership, the number of Emerging Leader programs has grown from 1 cohort every 2 years to 1 cohort every 6 months, and participants now engage in 4 residential experiences. “Emerging leaders who have engaged with Arrow over the last nine years know of Julian’s generosity of spirit and depth of character. “He has been determined to make every experience profound in enabling participants to be led more by Jesus, to lead more like Jesus, and to lead more to Jesus,” Liam said. Julian first engaged with Arrow Leadership in 2001 as a participant in the Emerging Leaders Program. At the end of this experience, he was invited to become State Coordinator for Victoria, and served in this role until he was appointed Program Director of the Emerging Leaders Program. “I look forward to the new opportunity, and remain as committed as ever to the development of Christian leaders in Australia,” Julian said. *Poland was not present at this gathering. Arrow Leadership Australia is a premier Christian provider of training and mentoring for emerging and mature leaders in church, NFP and education contexts in the Asia-Pacific region. In its 21 years of service, over 500 emerging and executive leaders are part of the Australian Arrow Leadership community. For more information please contact Liam Glover.